LOS ANGELES - Lightning struck 14 people, killing one, as rare summer thunderstorms swept through Southern California on Sunday, authorities said. A 20-year-old man was killed at Venice Beach in Los Angeles when lighting hit the area around 2:30 p.m., CBS Los Angeles said. A total of 13 people, including a 15-year-old, were struck by lighting at Venice Beach, city fire spokeswoman Katherine Main said. Four people were treated at the scene and the rest were taken to hospitals. The 20-year-old was pronounced dead at Marina Del Rey Hospital, the coroner's office said. One other person was in critical condition, CBS Los Angeles reported. Fire officials said most of those taken to hospitals were mainly shaken up and were expected to recover. Some appear to have been in the water and others on the beach's famed boardwalk. 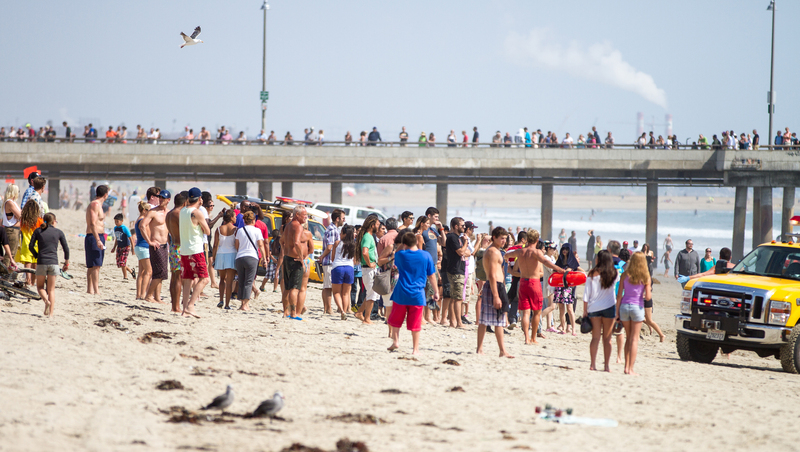 Lifeguards performed CPR on at least one person pulled from the water. The lightning strikes occurred as a thunderstorm hit the island, causing minor flooding and setting two small fires in the brushy backcountry that were quickly doused, Denning said. The unusual weather came from monsoon moisture that brought a line of brief but fierce afternoon thunderstorms to the region. Hundreds of lightning strikes were reported, but the storms were vanishing by later Sunday afternoon as they moved northwest.